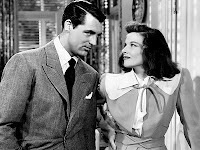 Believe it or not, despite her early success in films including winning her first Oscar for Morning Glory in the split year 1932-33, by the end of the 1930s, Katharine Hepburn had begun to be known as box office poison and was dumped by RKO, so she retreated to the New York stage where she triumphed in the role of Tracy Lord in Philip Barry's The Philadelphia Story, which debuted March 29, 1939 with Joseph Cotten, on loan from Orson Welles' Mercury Theatre, in the role of C.K. Dexter Haven and Van Heflin as Macaulay "Mike" Connor. 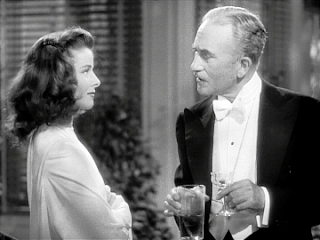 As Josh R wrote in his Centennial Tribute to Hepburn, "(she) secured the film rights (thanks to Howard Hughes), and more or less strong-armed Louis B. Mayer into letting her repeat her performance for the MGM film adaptation. The role of Tracy Lord, a haughty socialite who views the imperfections of others as an insupportable blemish on her otherwise charmed existence, cannily exploited her natural imperiousness and debunked the prevailing notion that the actress was too proud to show her flaws." Now, she didn't get all the casting she sought. 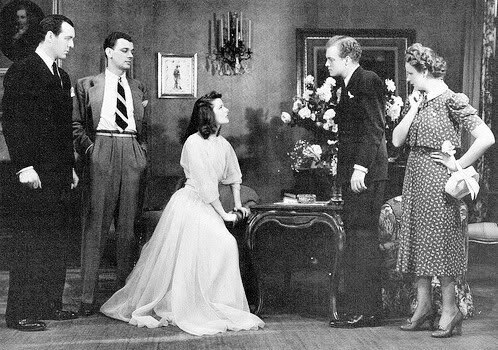 She'd hoped to either get Spencer Tracy or stage co-star Van Heflin, as Ivan G. Shreve, Jr. pointed out in his Centennial Tribute to Heflin, to play Mike alongside Clark Gable as Dexter, but work commitments prevented it and Cary Grant and James Stewart turned out to be more than acceptable and with Joseph L. Mankiewicz producing and George Cukor directing, the play made a fairly smooth transfer to the screen 70 years ago today. The film begins with a nearly silent prologue detailing the quick but comically brutal end of the marriage between wealthy ship builder C.K. 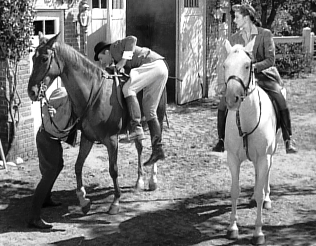 Dexter Haven (Grant) and socialite Tracy Lord (Hepburn). As Dexter moves his things out of the Lord estate, Tracy follows with his golf bag, stopping to remove a club and snap it in half. 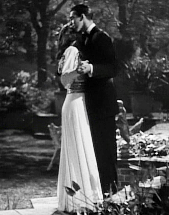 A furious Dexter's first instinct is to sock Tracy in the jaw, but he holds back and just shoves her in the face, as if he's James Cagney and she's Mae Clarke only minus the chair and the grapefruit, and Tracy tumbles backward through the doorway and lands in the entryway. Flash forward two years later as Tracy prepares for her second wedding, to one George Kittredge (John Howard) though her little sister Dinah (scene-stealer Virginia Weidler) would rather Dexter return as well as her own father Seth Lord (John Halliday), who has left their mother Margaret (Mary Nash) to carouse elsewhere, though Tracy seems more upset about her father's actions than her mother does. Meanwhile, at the offices of the tabloid magazine Spy, one of its top reporters, Macaulay Connor (Stewart) is ready to storm into the office of its unscrupulous owner Sidney Kidd (Henry Daniell) and tell him he won't take any more of his sleazy assignments because he's going to devote himself full-time to being a real writer. His frequent photography partner Liz Imbrie (Ruth Hussey) would love to follow the same course, but she's too addicted to having a roof over her head and food in her stomach to quit in a huff. Before Connor, known as Mike to his friends, can get much of his spiel out, Kidd already has explained the new assignment: They are to infiltrate the upcoming nuptials of Tracy Lord and George Kittredge. When his employees suggest that getting in may not be an easy thing to do, Kidd has them show Dexter in, introducing him as a friend of Tracy's brother, though Liz recognizes him as her first husband because Liz was the only photographer whose camera he didn't break during his honeymoon with Tracy. Mike asks if he's doing it to get even and Dexter says it's something like that, but he doesn't sound convincing. Despite his plan to stand on principle, Mike agrees to cover the society wedding. 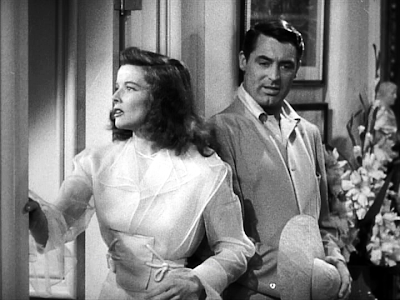 Re-watching The Philadelphia Story this time, one thing I noticed that had escaped my attention before was how subtly they played Dexter's status as a reformed alcoholic and how his drinking may have had a great deal to do with the quick dissolution of his marriage to Tracy. At one point, when he talks to Mike, Mike mentions that he only drinks a little and Dexter responds, "I thought all writers drink to excess and beat their wives." then with a glance at Tracy, "You know, it occurs to me that at one time I wanted to be a writer." Later in the film, when Mike goes on a real bender and shows up on Dexter's doorstep, it's the first time Dexter explicitly says that he no longer drinks. Mike's there to berate Dexter for what he sees as his mistreatment of Tracy earlier in the day and by dragging him and Liz there to feed on her. When Mike confesses the things he could tell him about Sidney Kind, Dexter tells him the truth and starts to get some good blackmail stories of his own that he hopes to use against Kind to save Tracy's father's reputation. In a way, The Philadelphia Story can be seen as Tracy Lord's transformation from a haughty socialite who looks down upon many to a human being, and Tracy is often couched in some pretty harsh terms. Dexter often compares her disdainful look to the withering glance of a goddess and tells her that she's far and away her favorite person in the world. Kittredge sees in her a "kind of a beautiful purity, like a statue." It's her father who delivers the harshest blows when he all but blames her for his infidelities and for acting more jealous than his wife does. "What most wives fail to realize about their husband's philandering is that it has nothing whatsoever to do with their wife," he tells them both. When Tracy inquires further, Seth plunges deeper. "A reluctance to grow old, I think. A devoted young girl gives an old man the illusion of youth." When Tracy (correctly) accuses her father of blaming her for his cheating, he hits her with the hardest blow. "You have everything it takes to make a wonderful woman except one thing — an understanding heart. Without that, you might as well be made of bronze." In contrast, when Mike and Tracy later get their drunk on together (only the second time in her life she's imbibed), Mike doesn't compare her to a goddess or a statue, but "a radiant queen." At least royals are human, so rumor has it. Hepburn should have been a leading contender for her second Oscar in her screen comeback, but she lost to her Stage Door co-star Ginger Rogers, someone who deserved a win at one time or another but instead got it for a somewhat out-of-character turn in the soapy Kitty Foyle. 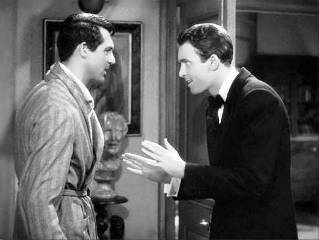 One thing about Hepburn's performance that stood out for me this time was her excellent use of hand gestures. Many times, she completes sentences and thoughts with simple sweeps of her hands instead of words and it's perfect, subtle and funny. Of course, the Academy more than made it up to Kate decades later. Still, while half of Stewart's schnockered sequence gets played with Grant, the real magic comes in the scenes he plays with an equally hammered Hepburn. Her interest in the young reporter already had prompted her to look up the book he'd written and left her suitably impressed, telling him he talks so big and tough but then writes like that. It's part of Tracy's humanization, the other coming when Dexter's wedding gift turns out to be a model of a ship he built for them that met an untimely end. It annoys Kittredge, but touches Tracy. If her heart is bronze, it's melting. Still, even in her drunken state, she thinks that Mike may be a snob, at least against High Society (the title of the later musical version of the story). 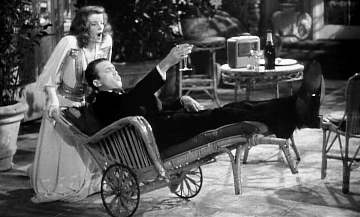 "The prettiest sight in this fine pretty world is the privileged class enjoying their privileges," Mike slurs to her, before she wheels him in a chaisse lounge off for a late-night swim. Mike, who has never allowed himself time for women, has convinced himself he's falling for Tracy while Liz Imbrie pines in silence for him. Dexter asks her, after she ends up staying to help him type up his blackmail note to Kind, why she doesn't marry Mike. "He still has a lot to learn and I don't want to get in his way," the photographer tells him. Dexter asks Liz what she'll do if another woman gets to him first and then she admits she guesses she'll be forced to scratch her eyes out. By this time, it's early morning when Dexter has returned Liz to the Lord estate and before he can exit he spots Kittredge coming with something on his mind. Over his shoulder, Dexter sees the returning Mike and Tracy and failing to get Kittredge out of the way tries to pre-emptively stop the explosion about to occur. 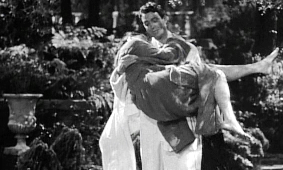 Clad in bathing robes, Mike and Tracy appear on the horizon with the writer crooning, "Over the Rainbow" to the socialite bundled in his arms. A still loopy Tracy gleefully greets Dexter and Mike, but significantly lowers her voice to say, "Hello, George." Dexter urges Mike to take Tracy to her room and try not to wake Dinah, unaware that the little dickens already is up and spying from her window. Dexter tries to calm George, but to little avail. When Mike returns a little while later, Kittredge is ready for war so to prevent too much damage, Dexter acts just as outraged and socks Mike himself, apologizing but explaining he figured he'd hurt him less after Kittredge leaves. 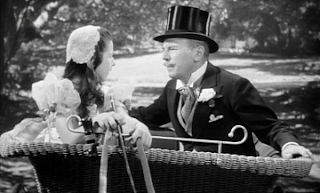 A little while later, as a hungover Uncle Willie greets the day against his will, he's informed by the butler that Dinah is waiting for him outside and she takes him on a horse and buggy ride (which his head certainly did not need) and fills him on what she saw. Dexter joins them and does his best to convince her that she dreamed it. 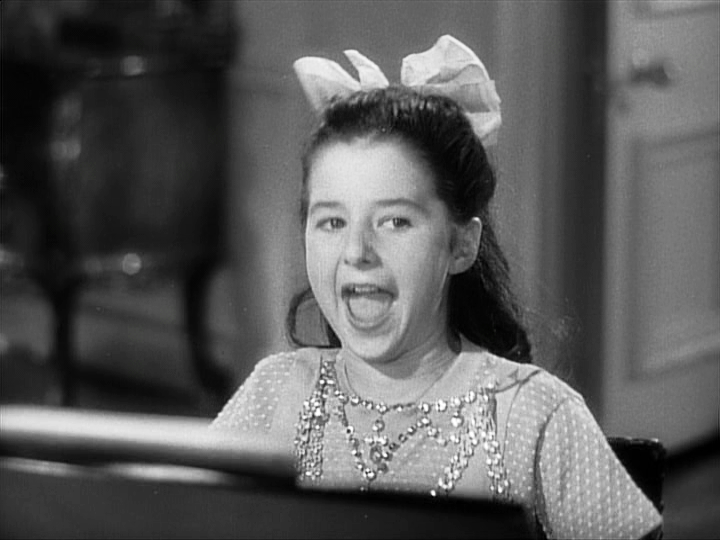 When Tracy arises later, she gets a letter from George so outraged by her actions, that he thinks they should call off the wedding, but Kittredge arrives as she reads it aloud to everyone within shouting distance. However, when Kittredge realizes that Dexter knows Sidney Kind and Mike and Liz work for him, he suddenly has a change of heart, considering the publicity potential. With so many suitors, even if you've never seen The Philadelphia Story, you can probably guess how it turns out. 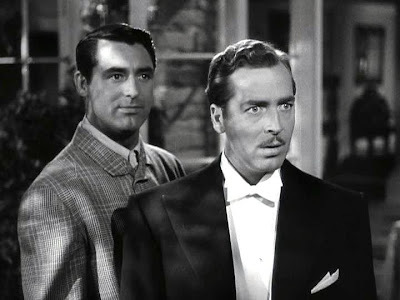 Cukor moves it along well for a farce, even if some of its attitudes are hopelessly dated and it is a bit too long, but coming from the stage with that many characters, it would be hard not to be. Still, with a cast this great, it makes it all worthwhile. Of course, in the end, Dinah takes credit for making everything work out the way it did. The last time I saw this, it struck me that The Academy probably nominated the wrong person in the supporting actress category. 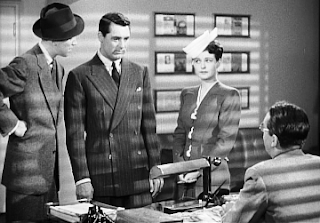 Hussey is fine, but ever a role was begging for Eve Arden, that was it, and Hussey really does seem like a poor man's Arden for the most part (it's pretty clear whose inflections she's imitating). 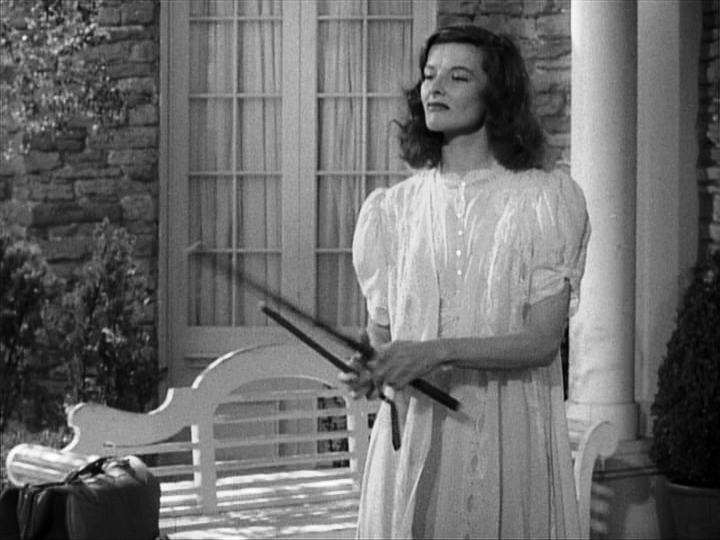 Weidler really does steal most of the scenes she's in - including those with Hepburn.